When it comes to vintage divination devices, I’ve always had a bit of a soft spot for the Magic 8-Ball. With over one million units being sold every year since 2012, the toy is fairly ubiquitous and continues to be a popular resource for instant “answers” to life’s most pressing questions. From a practicality standpoint, it was always far more accessible to me than trying to crack open the mystical powers of the Ouija board – another staple in the Coopee family gaming closet. The Magic 8-Ball had an inauspicious beginning. In the 1940s, Albert Carter of Cincinnati, Ohio developed the original version of the toy. Dubbed the “Syco-Seer”, Carter drew inspiration from one of the tools of his mother’s trade (she was a professional clairvoyant) – he created a phony “spirit writing device” called the Psycho Slate. The full name of the product was Syco-Seer: The Miracle Home Fortune-Teller and it consisted of a 7-inch tall tube that was divided in half. Each half was filled with a dark liquid and contained a standard die with different answers printed on all sides. With a viewing window on each end, simply flipping the Syco-Seer over would reveal an answer to any question that was posed to it. Several years later, the design was modified to make it smaller and less expensive to produce and was re-branded under the name of Syco-Slate: The Pocket Fortune Teller. In 1946, Carter and his cousin Abe Bookman formed a novelty toy company, Alabe Crafts (the name drawn from letters in each of their first names – Albert and Abe) to market the device. The Syco-Slate was shorter and contained only a single viewing window. The Magic 8-Ball has three registered patents. 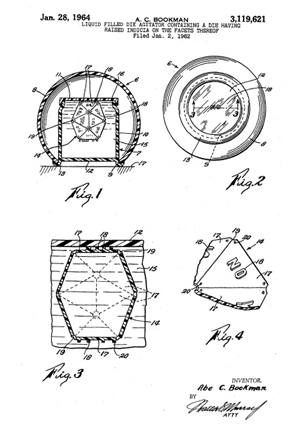 The patent diagram from #3,119,621 shows the inner workings of the liquid-filled die agitator, a view of the bottom of the Magic 8-Ball where all the answers are revealed and a cut-away of the 20-sided icosahedron die. The answers inside the Magic 8-Ball can be broken down into three categories: 10 are affirmative, 5 are negative and 5 are non-committal. According to probability theory, it takes an average of 72 questions for all 20 of the Magic 8-Ball’s answers to appear at least once. Sales were stagnant and the toy failed to gain any traction in the market, despite the fact that part of the marketing plan included having women dressed up as gypsies demonstrate it to curious on-lookers. Carter passed away in 1948, leaving all future decisions relating to the product and company to Bookman, who switched to a new format that resembled a fortune teller’s crystal ball. But the change prompted only a minimal uptick in sales. Was the end in sight for the toy? All signs pointed to YES, until Cincinnati’s Brunswick Billiards commissioned Bookman to produce a version of the toy in the now familiar black-and-white 8-ball format as part of a promotional campaign. Seizing the opportunity to breathe new life into the floundering toy, Alabe simply encased the liquid cylinder from previous models into an over-sized pool ball. The rest, as they say, is history. Brunswick’s promotional campaign was a resounding success, providing a confidence boost and a new marketing angle for Alabe. When the campaign ended, Alabe began mass-producing the toy under the name Magic 8-Ball. Ideal Toys bought Alabe in 1971 and made some revisions to the toy. In 1987, View-Master International acquired Ideal, forming the View-Master Ideal Group (VMIG). VMIG re-packaged and re-priced the Magic 8-Ball paving the way for the company’s acquisition in 1989 by Tyco Toys. Mattel eventually took over the toy’s mystical reigns when it acquired Tyco in 1997. 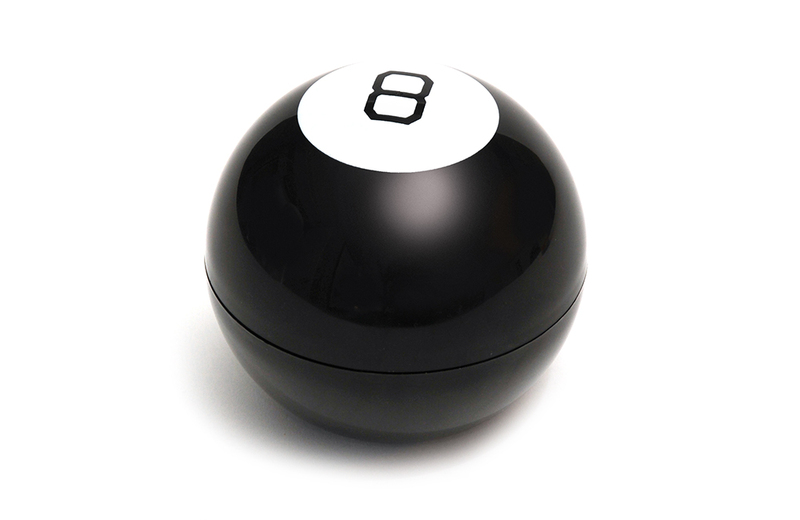 Today, the Magic 8-Ball enjoys on-going sales success, appears in various different sizes, and can even be downloaded as an app to provide decision-making options on mobile devices. How do you measure success? Answering this ambitious question is the object of Careers, a classic “roll-and-move” board game first released in 1955 by Parker Brothers.